I've been pretty successful making AI from scratch for the missions for the soviets, but skirmish AI is a whole different animal. My first priority is to write over the existing AI so that we have a semi-functional AI, and for the most part, I've been able to do this. I can make the AI build a base. However, when I try to replace the Teams with my units, worldbuilder refuses to save the changes I've made. I know dutchy was able to get his changes in, but for some reason, WB just won't save my edits to the Teams, no matter what. So I tried opening the script file in notepad, and it was complete gibberish. Next I tried wordpad, and it made slightly more sense, pic below. SO I guess my question is: is there a program out there to edit .scb files like generals uses for the AI? Or, is there a magic button I can press so that WB saves my changes to the Teams? Ehm, no, i don't speak computer. As far as I know only wb can read scb files. why doesn't it work, i know from generals that i could change the teams, so I don't know why it doesn't work here. Let me run it @ home before going to theorethical/start saying stuf i don't know. 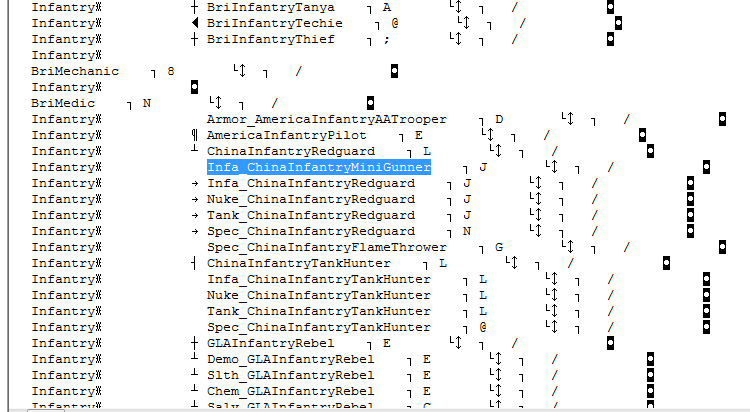 DaFool, there ain't any other way then using the Generals World Builder to edit the AI. As for your problem: speak to me via MSN. There may be some small thing you overlooked. ok, i had the script window open while editing the teams, which I guess was the problem.